Dario Saric scores 19 points as the Timberwolves get the win over the Heat, 111-109. There’s been a recent movement rallying against Luka Doncic winning ROY because he played professionally in Europe. The Starters show it’s not as easy as it looks for international players. Al Horford records a triple-double, Kyrie Irving adds 25 points as the Celtics defeat the Heat. Goran Dragic with the incredible hustle for your Heads Up Play of the Day! Goran Dragic tallied a triple-double against the Mavericks and he joins via arena link to talk Heat reclaiming the eight seed. Goran Dragic drops 22 points as six Miami Heat players reach double digits to defeat the San Antonio Spurs, 110-105. Selected by the San Antonio Spurs in the second round (45th overall) of the 2008 NBA Draft…draft rights were traded from San Antonio to the Phoenix Suns in exchange for the draft rights to Malik Hairston (48th overall), a 2009 second-round pick and cash considerations on June 26, 2008…signed by the Suns on Sept. 22, 2008 after reaching a buyout with Spanish team Tau Ceramica and receiving his official release…traded along with a first-round draft pick to the Houston Rockets for Aaron Brooks on Feb. 24, 2011…signed as a free agent by the Suns on July 19, 2012…was acquired by the HEAT on Feb. 19, 2015 along with Zoran Dragić in a three-team trade involving the Suns and the New Orleans Pelicans in which Miami sent Norris Cole, Justin Hamilton and Shawne Williams to New Orleans and Phoenix received Danny Granger and a pair of first-round draft picks from Miami and John Salmons from New Orleans…re-signed with the HEAT on July 9, 2015. Has appeared in 722 NBA regular season games (486 starts) during his 10-year career and has averaged 13.7 points, 4.8 assists, 3.1 rebounds, 1.03 steals and 28.0 minutes while shooting 46.9 percent from the floor, 36.4 percent from three-point range and 76.2 percent from the foul line…has missed 43 games due to injury/illness, 36 as a DNP-CD and one while in transit after being traded…was an All-NBA Third Team selection once…captured the NBA Most Improved Player Award once…has been selected the NBA Eastern Conference Player of the Week twice and the Western Conference Player of the Week twice…has scored in double figures on 486 occasions, including 176 games with at least 20 points, 25 games with 30-or-more points and one 40-point performance…his career high for consecutive double-figure scoring games is 60 (Jan. 3-Nov. 15, 2017)…his longest streak of consecutive 20-point games is seven (Jan. 27-Feb. 8, 2014)…has averaged double figures in scoring in each of his last seven seasons…has grabbed double-figure rebounds on eight occasions and handed out double-figure assists 55 times…has posted 58 double-doubles and one triple-double…his longest streak of consecutive games handing out double-figure assists and his longest streak of consecutive double-doubles is five and both occurred from Mar. 16-24, 2013…his career high for most consecutive field goal attempts made is nine (Feb. 23, 2014) and his career high for consecutive free throws made is 27 (Nov. 6-22, 2017)…his career high for most free throws made in a game without a miss is 11 and it has occurred twice (at the L.A. Lakers on Dec. 10, 2013 and at Houston on Apr. 13, 2012)…his longest stretch of consecutive games with a three-point field goal made is 15 (3 times: Apr. 12-Nov. 15, 2017, Mar. 4-Apr. 5, 2017 and Jan. 6-Feb. 6, 2017)…has 215 multi-trey games…has recorded 200 multi-steal games and 18 multi-block performances…his longest stretch of consecutive games with a steal is 15 (Mar. 4-30, 2012) and his longest stretch of consecutive games with multiple steals is 10 (Nov. 9-27, 2012)…his high for most assists in a game without a turnover is 13 (at Orlando, Nov. 24, 2013)…ranks among the HEAT all-time leaders in assists (6th), scoring average (7th), free throw percentage (10th), three-point field goals made (10th), three-point field goals attempted (10th), points scored (13th), double-figure scoring efforts (13th), field goal percentage (13th), field goals made (tied-13th), field goal attempts (14th), games started (14th), free throws made (15th), free throws attempted (16th), minutes played (16th), steals (19th) and three-point field goal percentage (23rd)…has appeared in 35 NBA playoff games (19 starts) and has averaged 12.7 points, 3.2 assists, 3.2 rebounds and 24.7 minutes while shooting 44.9 percent from the floor, 34.6 percent from three-point range and 74 percent from the foul line…has scored in double figures on 23 occasions in postseason play, including eight games with at least 20 points and one 30-point performance…has scored in double figures in his last 18 playoff games dating back to Apr. 20, 2016, the longest streak of his postseason career…his postseason career high for consecutive 20-point games is three (April 16-21, 2018 and May 1-5, 2016)…has handed out double-figure assists once in postseason play. Started all 72 games in which he appeared for the HEAT and averaged 14.1 points (.477 FG%, .727 FT%), 5.8 assists, 3.8 rebounds, 0.99 steals and 32.8 minutes…officially missed seven games due to injury and was a DNP-CD for three others in which he dressed despite suffering from a strained left calf…sat out one game (Dec. 22) with a sore left wrist, five games (Nov. 25-Dec. 7) with a strained left calf and one game (Mar. 28) with a cold…set single-season career highs in both defensive (223) and total (277) rebounds…ranked among the NBA leaders in assists per game (18th) and field goal percentage (36th)…led the HEAT in assists…finished second in minutes played, double-figure scoring efforts, field goals made and attempted and charges taken and third in points scored and steals…topped the HEAT in scoring six times, in assists a team-high 50 times, in steals 21 times, in minutes played on 14 occasions, in plus/minus a team-high 14 times, in blocks twice and in rebounds once…scored in double figures on 55 occasions, including 12 games with at least 20 points…scored in double figures a season-high 20 consecutive games from Feb.5-Mar. 22…grabbed double-figure rebounds once and handed out double-figure assists a team-high four times…recorded five double-doubles…recorded his 2,500th career assist on Feb. 9 vs. San Antonio…scored his 7,000th career point on Mar. 30 against the Lakers in Los Angeles…made his 300th career start on Jan. 6 vs. New York…grabbed a career-high 12 rebounds on Apr. 7 vs. Chicago…grabbed five offensive rebounds at Orlando on Apr. 8 to match his career high…Season Highs: 26 points (at Chicago, Mar. 11), 12 rebounds (vs. Chicago, Apr. 7), 11 assists (three times), four steals (twice), two blocks (three times) and 41:21 minutes (at Memphis, Dec. 29). Split the season between the HEAT and the Phoenix Suns…started all 78 games in which he appeared and averaged 16.3 points (.501 FG%, .774 FT%), 4.5 assists, 3.5 rebounds, 1.00 steals and 33.8 minutes…missed a total of six games, two officially due to injury (Dec. 14-15 with a low back strain), one while in route after being traded and three that were officially listed as DNP-CDs although he dressed for two of them (Mar. 7-9) despite being injured with a lower back contusion…led all guards and ranked 19th overall in the NBA in field goal percentage and also ranked among NBA leaders in minutes per game (29th), assists per game (31st) and scoring average (39th)…set a single-season career high in offensive (81), defensive (193) and total (274) rebounds…scored in double figures 68 times, including 27 games with at least 20 points and one 30-point performance…handed out double-figure assists three times and grabbed double-figure rebounds once…recorded four double-doubles…appeared in 26 games with the HEAT and averaged 16.6 points (.502 FG%, .808 FT%), 5.3 assists, 3.4 rebounds, 1.08 steals and 34.8 minutes…topped the HEAT in scoring four times, in assists 17 times, in minutes 10 times, in steals on eight occasions and in blocks twice…appeared in 52 games with the Suns and averaged 16.2 points (.501 FG%, .746 FT%), 4.1 assists, 3.6 rebounds, 0.96 steals and 33.4 minutes…topped the Suns in scoring 11 times, in assists 16 times, in steals on 12 occasions, in rebounds three times and in blocks once…hit a career-high 26 consecutive free throw attempts from Feb. 23-Mar. 4…scored his 6,000th career point vs. San Antonio on Mar. 31…scored his 5,000th career point at the L.A. Clippers on Nov. 14…handed out his 2,000th career assist at Houston on Dec. 6…hit his 1,000th career free throw vs. Indiana on Dec. 2…hit his 500th career three-point field goal and recorded his 500th career steal vs. the L.A. Lakers on Mar. 4…played his 500th career game vs. Chicago on Apr. 9…grabbed a career-high five offensive rebounds vs. Denver on Mar. 20…Season Highs: 34 points (vs. Indiana, Dec. 2), 13 assists (at Dallas, Dec. 5), 10 rebounds (vs. Philadelphia, Jan. 2), four steals (vs. Indiana, Dec. 2), two blocks (vs. Chicago, Jan. 30) and 46:19 minutes (vs. Sacramento, Nov. 7). Appeared in 76 games (75 starts) for the Suns and averaged 20.3 points (.505 FG%, .760 FT%), 5.9 assists, 3.2 rebounds, 1.37 steals and 35.1 minutes…missed six games due to injury…sat out five games (Nov. 5-8, Apr. 11, Apr. 16) due to a sprained left ankle and one (Feb. 26) with a sprained right ankle…earned All-NBA Third Team honors and was named the NBA Most Improved Player…was named the Western Conference Player of the Week for the Week ending Feb. 2…finished 16th in the voting for NBA MVP…ranked among the NBA leaders in fast break points per game (tied-6th), three-point field goal percentage (15th), free throw attempts per game (tied-16th), scoring average (18th), assists per game (18th), field goal percentage (26th), steals per game (28th) and minutes per game (29th)…became just the fourth player in NBA history to exceed 20.0 points, 5.0 assists, 50.0 FG% and 40.0 3-PT FG% in a single-season joining LeBron James (2012-13), Jeff Hornacek (1991-92) and Larry Bird (1984-85, 1986-87, 1987-88)…set single-season career highs in points, scoring average, field goals made and attempted, field goal percentage, three-point field goals made and attempted, three-point field goal percentage, free throws made and attempted and minutes…led the Suns in points, scoring average, field goals made and attempted, field goal percentage, three-point field goal percentage, free throws made and attempted, assists and minutes…topped the Suns in scoring a team-high 30 times, in assists a team-high 51 times, in steals on 22 occasions, in blocks six times and in rebounds three times…scored in double figures 73 times, including 37 games with at least 20 points, nine games with 30-or-more points and his lone 40-point performance (all of which are single-season career highs)…scored at least 20 points in a career-high seven consecutive games from Jan. 27-Feb. 8…handed out double-figure assists six times and grabbed double-figure rebounds once…amassed seven double-doubles…had a career-high 39 multi-trey games…scored his 4,000th career point vs. Dallas on Jan. 17…grabbed his 1,000th career rebound vs. Boston on Feb. 19…played in his 400th career game vs. Houston on Feb. 23…scored a career-high 40 points vs. New Orleans on Feb. 28…connected on a career-high 14 field goals on Feb. 23 vs. Houston and matched that total two games later vs. New Orleans on Feb. 28…Season Highs: 40 points (vs. New Orleans, Feb. 28), 14 assists (at Denver, Feb. 18), 10 rebounds (vs. L.A. Lakers, Jan. 15), five steals (twice), three blocks (at New Orleans, Apr. 9) and 47:54 minutes (at New York, Jan. 13). Started all 77 games in which he saw action for the Suns and averaged 14.7 points (.443 FG%, .748 FT%), 7.4 assists, 3.1 rebounds, 1.61 steals and 33.5 minutes…sat out three games due to injury and was a DNP-CD for two games (Mar. 27-28) to rest…missed one game (Dec. 9) due to the flu, one game (Dec. 28) due to a hip contusion and one game (Apr. 17) with a right ankle injury…set single-season career highs in assists, steals and blocks…ranked among the NBA leaders in assists (8th), steals (17th) and assists-to-turnover ratio (20th)…led the Suns in points, scoring average, three-point field goals attempted, free throws made and attempted, assists, steals, minutes and starts…joined LeBron James, Stephen Curry and Kemba Walker as the only four players in the NBA to lead their team in points, assists and steals in 2012-13…topped the Suns in points a team-high 18 times, in assists a team-high 59 times, in steals a team-high 29 occasions, in blocks eight times and in rebounds twice…scored in double figures 65 times, including 15 games with at least 20 points and a pair of 30-point performances…handed out double-figure assists a career-high 20 times and recorded a career-high 19 double-doubles…had a career-high 38 multi-steal games…amassed multiple steals in a career-high 10 consecutive games from Nov. 9-27…scored his 3,000th career point vs. Atlanta on Mar. 1…hit his 1,000th career field goal vs. Dallas on Feb. 1…played in his 300th career game at Minnesota on Dec. 29…handed out a career-high 18 assists at Portland on Feb. 19…made the first career game-winner, a two-foot layup with 0.5 seconds left vs. Memphis on Dec. 12…Season Highs: 32 points (vs. Golden State, Apr. 5), 18 assists (at Portland, Feb. 19), nine rebounds (vs. Brooklyn, Mar. 24), five steals (twice), three blocks (vs. Philadelphia, Jan. 2) and 43:34 minutes (at Memphis, Dec. 4). Appeared in all 66 games (28 starts) for the Houston Rockets and averaged 11.7 points (.462 FG%, .805 FT%), 5.3 assists, 2.5 rebounds, 1.29 steals and 26.5 minutes…was named NBA Western Conference Player of the Week for the week ending Apr. 8…ranked among the NBA leaders in assists per game (21st) and steals per game (27th)…led the Rockets in assists and steals and finished second in points and field goals made and attempted…joined Luis Scola as the only Rockets to play in all 66 games…topped the Rockets in scoring 12 times, in assists a team-high 35 times, in minutes on 10 occasions and in rebounds once…scored in double figures 39 times, including 13 games with at least 20 points…handed out double-figure assists nine times and recorded eight double-doubles…recorded a steal in a career-high 15 consecutive games from Mar. 4-30…scored his 2,000th career point at Portland on Apr. 9…made a career-high 13 free throws on Apr. 11 vs. Utah…Season Highs: 26 points (at L.A. Lakers, Apr. 12), 14 assists (at L.A. Clippers, Mar. 17), seven rebounds (vs. L.A. Lakers, Mar. 20), four steals (four times), one block (10 times) and 47:40 minutes (vs. Dallas, Mar. 24). Split the season between the Phoenix Suns and Houston Rockets…saw action in 70 games (five starts) and averaged 7.5 points (.435 FG%, .624 FT%), 2.9 assists, 2.0 rebounds and 17.6 minutes…missed a total of eight games due to injury/illness…missed seven games (Jan. 30-Feb. 13) with a left foot injury and one game (Feb. 27) with flu-like symptoms…scored in double figures 23 times…grabbed double-figure rebounds on three occasions and handed out double-figure assists three times…posted five double-doubles and one triple-double…appeared in 48 games (two starts) with Phoenix and averaged 7.4 points (.421 FG%, .608 FT%), 3.1 assists, 1.8 rebounds and 17.8 minutes…finished third on the Suns in assists…led Phoenix in scoring and rebounds once each and in assists five times…appeared in 22 games (three starts) with Houston and averaged 7.7 points (.472 FG%, .667 FT%), 2.5 rebounds, 2.5 assists and 17.2 minutes…topped the Rockets in assists three times, in minutes twice and in rebounds once…recorded his lone career triple-double with 11 points, 11 rebounds and 11 assists in the season finale at Minnesota on Apr. 13…grabbed career highs in both defensive (9) and total (11) rebounds at Minnesota on Apr. 13…played a career-high 53 minutes vs. Dallas on Apr. 11…scored his 1,000th career point at Charlotte on Nov. 20…played in his 200th career game vs. Atlanta on Apr. 3…Season Highs: 17 points (twice), 11 rebounds (at Minnesota, Apr. 13), 11 assists (at Minnesota, Apr. 13), four steals (twice), two blocks (vs. L.A. Clippers, Apr. 9) and 53:00 minutes (vs. Dallas, Apr. 11). Appeared in 80 games (two starts) for the Suns and averaged 7.9 points (.452 FG%, .736 FT%), 3.0 assists, 2.1 rebounds and 18.0 minutes…missed two games (Mar. 4-6) due to a sprained right ankle…ranked 25th in the NBA in three-point field goal percentage…finished second on the team in assists…topped the Suns in scoring once, in steals 16 times and in assists five times…scored in double figures on 25 occasions, including three games with at least 20 points and one 30-point performance…handed out double-figure assists on three occasions and posted one double-double…Season Highs: 32 points (at Utah, Jan. 25), 10 assists (three times), seven rebounds (vs. New Orleans, Nov. 11), four steals (vs. Golden State, Jan. 23), one block (eight times) and 39:57 minutes (at Oklahoma City, Feb. 23). Saw action in 55 games for the Suns (one start) and averaged 4.5 points (.393 FG%, .769 FT%), 2.0 assists, 1.9 rebounds and 13.2 minutes...missed two games (Dec. 29-30) with flu-like symptoms and was a DNP-CD on 25 occasions…topped the Suns in steals five times, in assists twice and in blocks once…scored in double figures six times…made his NBA debut at San Antonio on Oct. 29 and was scoreless with two assists and one rebound in 14:03 minutes of playing time…made his first NBA start at Sacramento on Nov. 14 and tallied five points, four assists, four rebounds and three steals in 30:22 minutes of play…Season Highs: 14 points (at L.A. Lakers, Feb. 26), eight assists (at Minnesota, Apr. 11), five rebounds (twice), four steals (at Memphis, Apr. 10), one block (three times) and 30:22 minutes (at Sacramento, Nov. 14). 2010: Came off the bench in all 16 games for the Suns and averaged 7.6 points (.430 FG%, .742 FT%), 2.3 assists, 1.8 rebounds and 14.8 minutes…was tied for second on the team in assists…scored in double figures on five occasions, including one 20-point performance…averaged 6.8 points (.419 FG%, .800 FT%), 2.0 assists, 1.2 rebounds and 14.8 minutes in the Opening Round vs. Portland…made his postseason debut on Apr. 18 vs. Portland and tallied six points, two assists and one rebound in 13:35 of action…averaged 9.0 points (.452 FG%, .500 FT%), 2.3 rebounds, 2.0 assists and 13.0 minutes in the Western Conference Semifinals vs. San Antonio…scored a postseason career-high 26 points (including 23 in the fourth quarter) in Game 3 in San Antonio on May 7…also set postseason career highs in field goals made (10) and attempted (13) and three-point field goals made (5) in the May 7 contest at San Antonio…averaged 7.5 points (.421 FG%, .800 FT%), 2.7 assists, 2.2 rebounds and 15.8 minutes in the Western Conference Finals vs. the L.A. Lakers…handed out a postseason career-high eight assists in Game 4 vs. the Lakers on May 25. 2016-17: Received the Robes Patton Memorial Award for media cooperation from the Miami chapter of the Professional Basketball Writers Association…2013-14: Earned All-NBA Third Team honors and captured the NBA’s Most Improved Player Award…was named the NBA Western Conference Player of the Week for the week ending Feb. 2…participated in the Skills Competition at All-Star Weekend…2011-12: Was named Western Conference Player of the Week for the week ending Apr. 8. 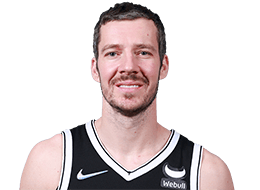 Full name is Goran Dragić…nicknames are “Gogi” which is short for Goran in Slovenia and “The Dragon” which was given to him as a rookie by Steve Nash…is the son of Marinko and Mojca Dragić…has one brother, Zoran, who he played with on both the Suns and the HEAT…married his wife, Maja, in 2013 in Slovenia and the couple has a son (Mateo) and a daughter (Viktoria)…speaks fluent Slovenian, Serbian, Spanish and English…received the Apple of Inspiration award by Slovenian President Borut Pahor in the summer of 2014 in recognition of his humanitarianism and success…serves as an ambassador for City of Hope, the world-renowned medical research and treatment center, and donated the Kia he received for winning the 2013-14 NBA Most Improved Player Award to the foundation…along with his brother, Zoran, launched a partnership with Blessings in a Backpack in November of 2014 to provide ready-to-eat food for 125 students at Cesar Chavez Community Center in Phoenix, the program mobilizes communities, individuals and resources to provide food on the weekends for elementary school children across America who might otherwise go hungry…lists former teammate Steve Nash as someone he admires because of his basketball skills, the fact he’s a role model for kids and also because he helped him a lot when Goran came to the NBA…would wake up at 3 am as a kid to watch NBA games in Slovenia which would be shown at 4 am…lists Michael Jordan, Allen Iverson and Steve Nash as some of his favorite players growing up, but his basketball heroes were Vlade Divac and Drazen Petrovic…hosts a yearly basketball camp in the off-season in Slovenia…when his playing career is over he would like to stay involved in basketball as either a coach or agent…his favorite sport other than basketball is soccer and he lists Real Madrid and AC Milan as his favorite teams…grew up playing soccer in Slovenia but an injury forced him to switch sports at age 11…enjoys watching movies and playing soccer and tennis in his free time…his first job was as a forklift operator in his mother’s book factory…says something most people don’t know about him is that he loves dogs…wears size 12.5 sneakers.